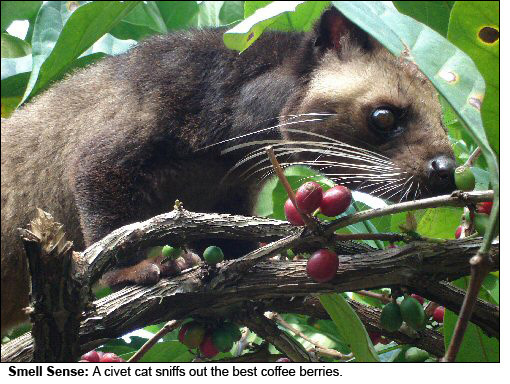 Demand for coffee brewed with beans plucked from the dung of the furry, weasel-like creatures – known locally as luwaks – is surging among well-healed connoisseurs around the world, exporters say. About 40 civets at Gunawan Supriadi plantation in West Lampung district, Sumatra, provide the intestinal machinery for his Raja Luwak (King of Luwak) brand of bean. Lampung is the undisputed capital of luwak coffee. “My target is to have 150 civets soon because I have to meet the surge in demand,” Supriadi said. The “golden droppings” of the luwak, or Asian palm civet, fetch up to US$800 per kilogram in countries like the United States, Australia, Japan, South Korea and Singapore. It’s another story altogether at retail level. Single cups of the world’s most expensive coffee have been known to sell for almost $100 in specialty outlets in London. The civets play two roles. Firstly, they tend to choose the best berries to digest. Experts say wild civets are the most discerning, but their droppings are also the most difficult to harvest. Having nibbled off the thin outer layer of fruit, the civets put their digestive juices to work. The enzymes penetrate the beans – usually arabica in Sumatra – and change their chemical balance in subtle ways. The end product, after a good wash and light roasting, lacks the bitterness of ordinary coffee and has a unique, soft flavour. “If luwak coffee is a car, then it must be a Rolls-Royce,” Supriadi said. Exporter Doni Irawan said his sales had grown 50 percent in the past year. “It has become the prima donna of coffee due to its high price and limited supply. It keeps gaining new, dedicated fans,” he said. The tradition of luwak coffee stretches back hundreds of years to the time of Dutch rule in Indonesia. Banned from their colonial masters’ coffee crops, indigenous farmers took to collecting, cleaning and roasting undigested beans found in the forest-dwelling animals’ droppings. The Southeast Asian archipelago of 240 million people is now the world’s main producer of luwak coffee, but the industry has really only flourished in recent years and official export figures are hard to find. Retailers said demand was also high among status-conscious members of Indonesia’s burgeoning middle class. In a country where around 40 percent of the population earns less than $2 a day, luwak coffee sells for about $8 a cup in upmarket shopping malls. “I never used to like coffee at all, but after trying luwak coffee my world changed. I became addicted,” Jakarta resident Galang Sulung Ramanda, 24, said. “I also drink it for its health benefits. I heard that it can prevent asthma, Parkinson’s, colon cancer and diabetes,” he said. The success of luwak coffee has given birth to a plethora of fake brands, which promise that special civet experience at half the usual price. Not to be outdone, Vietnamese entrepreneurs say they have developed a way to chemically treat regular beans to produce the same luwak taste.